bebopified: Eldar breaks through with a new "Point of View"
Eldar, wunderkind. His name does not, in fact, mean "aged person." In Hebrew, it means "God resides," and in the Norse languages, "warrior who fights with fire." 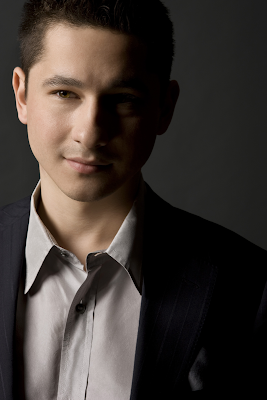 Eldar Djangirov started playing piano at age three in Kyrgyzstan. He loved jazz from the start (his father is a jazz fan), but the first live jazz he heard was of his own making. In 2006, when Eldar was nine, the influential and well-connected Charles McWhorter heard him play at a jazz festival in Siberia. Realizing they had a genius offspring, Eldar's parents soon moved the family to Kansas City, believing they were going where the jazz is. Now 26, Eldar lives in New York City, with seven (soon to be nine) albums to his credit and a long list of accomplishments: a scholarship to Interlochen, an appearance with Marian McPartland on "Piano Jazz"at 12 (thanks to McWhorter, who knew McPartland), catching the ear of Dr. Billy Taylor, who booked him on CBS's "Sunday Morning," performing live on the 2000 Grammys telecast, winning top prizes at the 2001 Lionel Hampton Jazz Festival and the 2002 Peter Nero Piano Competition, signing with Sony Classical at 17, playing jazz festivals all over the world, earning a Grammy nomination for his fifth release, "Re-Imagination" (2007). While Eldar is a virtuoso with preternatural dexterity, he's not a machine. While he plays with strength and power, he's not a pounder. He can deliver a lot of notes and chords flawlessly and at superhuman velocity, but they're not just precise and plentiful, which can be boring and cold. He brings intelligence and deep emotion to his playing. Hearing him live is both dazzling and moving. At his advanced age, Eldar is already revisiting his earlier efforts. The soon-to-be-released "Breakthrough," a trio album with Armando Gola on bass, Ludwig Afonso on drums (and special guests Chris Potter and Joe Locke), includes a new version of "Point of View," a song he recorded on his first CD for Sony, "Eldar" (2005), with the beloved saxophonist Michael Brecker. The original is an all-out race to the finish for both men (Eldar was then 18, Brecker 56). It's a great tune, a lot of fun to hear, full of fat chords, rapid-fire runs, breakneck unison passages, and playful back-and-forth. Brecker is the more imaginative improviser. Listen here. P.S. That's John Patitucci on bass, Todd Strait on drums. "Point of View Redux" (2013) seems twice as fast. The rhythms are more complex, the improvisations more interesting. There's no horn; this is a classic piano trio, on speed. The song is also more muscular. Can you improve over an outing with Michael Brecker? Probably not, but you can take a different direction. This, too, is fun to hear, but for a whole new set of reasons. Here it is. Another track from "Breakthrough" is available to sample in advance: Eldar's cover of Radiohead's "Morning Bell." (BTW Potter recorded this on his album "Underground," which came out in 2006.) It's surprising Brad Mehldau didn't get to this first. Passionate and shimmering, it signals Eldar's willingness to record more contemporary pop and rock tunes with a jazz sensibility, a smart move for a young musician these days. The rest of "Breakthrough" is mostly originals by Eldar, who is also a fine composer, and songs by Gershwin, Irving Berlin, Redd Evans ("No Moon at All"), and Ervin Drake ("Good Morning Heartache"). "Breakthrough" comes out April 9. A little over a month later, on May 14, Motema will release Eldar's classical solo piano debut, "Bach/Brahms/Prokofiev." ("Three Stories" from 2011 is a combination of jazz standards and classical pieces; "B/B/P" is all classical.) Both "Breakthrough" and "B/B/P" were recorded in the same week at different studios; both were self-produced for Motema. (So Eldar isn't with Sony anymore?) One track, the Sinfonia from Bach's Partita #2 in C minor, can be heard on Motema's website; go here and click on "mp3 - Classical Solo." Will he transform any of the other pieces on "B/B/P," as he did "Air on a G String" on "Three Stories"? Or will he play them straight? Either way, it seems that Eldar will inhabit both the jazz and classical worlds, something few musicians can do. Related: Live concert review from 2008.